When the workshop ends, we select some of our best pictures and prepare those images for an informal group exhibition locally. While learning about photography, the participants explore Icelandic culture by taking part in it, capturing it and also by displaying their work. One of our objectives is to deliver messages and draw the attention to the locals through pictures made in the project. Please note that this project is a learning/sharing camp and not a regular workcamp. We may be able to organize some outdoor voluntary service activities but this depends on the weather conditions. 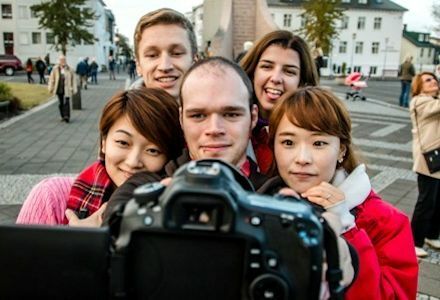 Participants should use the opportunity to share something about their own culture, such as food, music, games or films with the international group. The project combines learning, sharing, getting to know Iceland, its culture, having fun, exploring the capital city and some of the most stunning nature attractions in the Golden Circle excursion, which will be part of the project. Leisure time: Some excursions (e.g. South Shore, Hot River hike, Snæfellsnes or Reykjanes Peninsula) can be arranged at discount fares for the participants. Local leisure activities will also be offered such as cinema and flea market. Accommodation: The participants will stay in an equipped house in Reykjavík, about 4 km from the center of the city. The facilities are basic with a kitchen, showers, a washing machine. The group will sleep in shared rooms. Please bring your sleeping bag. Location: Reykjavik is a dynamic, modern city which lives in harmony with beautiful nature, using renewable energy sources - geothermal- and hydropower. The world’s northernmost capital bridges the Atlantic between Europe and North America. Reykjavík is spread across a peninsula with a panoramic view of the mountains and the Atlantic Ocean on almost all sides. It is an international city with a lively cosmopolitan cultural scene surrounded by beautiful nature. The music festival Sónar Reykjavík takes place April 25-27. Sónar is an experiment in how music can reach those who truly seek it by those performing it and seeing that it is not the largest stage or the biggest crowd that matters but also about the relationship that forms and the memories for all. Tickets for the festival are not provided but participants will however have free time to attend if they wish. The projects in May (May 9-18 and May 23-June 1) happen around the summer solstice, when the sun hardly sets and the nights are almost as bright as the days. The bright nights are magical and staying awake enjoying the beautiful surroundings is a unique experience. During the time of the projects, participants will have the opportunity to experience the midnight sun as there are 24 hours of light even if the sun sets for short periods of time. The fee includes transportation from the meeting point to the project site and back (on the first and last day), as well as the Golden Circle excursion.